Gossamer Packaging Machinery your End-of-Line Partner. Complete packaging line integration. 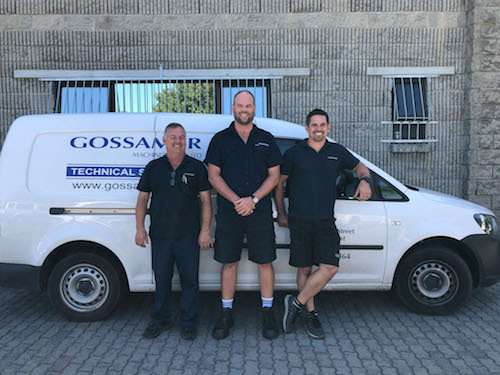 At Gossamer Packaging Machinery we are a group of passionate individuals whose mission is to create end-of-line solutions that will bring success to your business. We are a dynamic company and therefore offer the ability to adapt to your unique needs. We believe in preventative maintenance and after-sales support. Our maintenance and repair agreement can be added to new or existing equipment manufactured by Gossamer. These agreements can be tailored to cover anything from Preventative Maintenance Servicing up to fully maintaining the machine or anything in-between. Our YouTube channel is aimed at keeping you informed of what Gossamer Packaging Machinery is up to and what we do. Visit regularly to stay informed. Gossamer provides a comprehensive range of End-of-Line Automation Solutions that are designed to bring success to your business. For any requests, enquiries or PDF Catl please fill out the form below.